Visit at Martin McManus - tipplerzuechters Jimdo-Page! 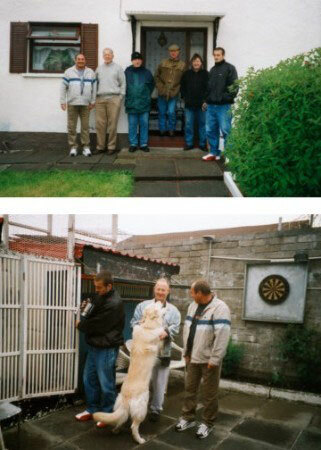 Bobby led us to Martin Mac Manus (man in the middle with the dog) on that day. We were allowed to see his loft and his pigeons. On the next day Mac Manus had a competition, we've been there, too. On the one photo are the pigeons in flight and on the other is Harry Shannon, the two referees J. O'Hare and Bobby Dunseith, Martin Mac Manus, my son and myself.